Our additional products include magnetic hanging solutions, poster hanging solutions, (panel) hooks, frames, and accessories for your rail system. 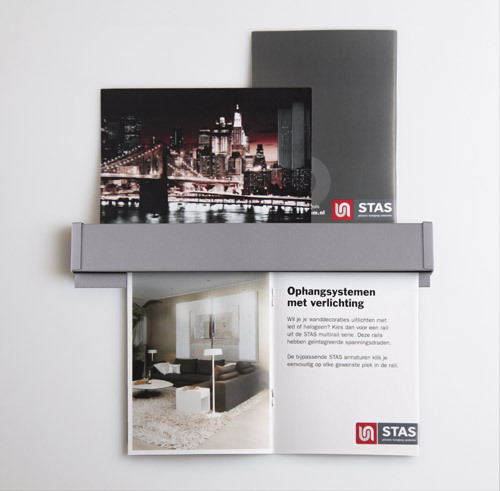 STAS click frames are high-quality aluminium frames, ideal for notices and small posters. Contents can be replaced without taking the frame off the wall. Equipped with a protective sheet. A magnetic rack with four coat hooks for your steel wall, cabinet or door. Elegant and functional. STAS offers various panel hooks, in many different shapes and sizes. So measure your partition, your cubicle wall or any other surface you'd like to hang something from and pick and choose. STAS drop ceiling hooks are pushed easily over the ceiling grid of the drop ceiling. Ideal for billboards, signage, garlands or any other lightweight item. Specifically designed to present cloth and heavier posters in a stylish way. STAS magnetic tape is a self-adhesive steel strip, perfect for hanging drawings, posters or photos. Available on rolls and can therefore be cut to any length. 30 m on roll, 16 mm wide. STAS magnetic strip literally turns your wall into a magnet. Perfect for pictures, drawings, posters or memos. Length: 50 or 100 cm, width: 5 cm. Small magnets on a steel cable hooked into your rail, that's STAS magnet set. Ideal for hanging papers, memos, pictures and postcards. STAS paper rail makes clever use of marbles. They hold notes, cards, photos and papers in place but release them just as easily. STAS papergrip is a rail that can be used in two ways. Thick or thin papers can be locked easily into the rail thanks to a foam strip. But they can also be placed on top of the rail in the special edge. With the STAS set up you can place and arrange picture frames and other objects in a stylish way. STAS picture hits are plastic clips with which to hang and interconnect photos, cards, memos, maps etc. Create a unique photo wall in just a few steps. STAS tunica is a coat hook that can be clicked anywhere into your picture rail. Special finishes on request. Hang coats, bags, mail and keys with STAS circus. Click the hanger anywhere into your picture rail. Special finishes on request.